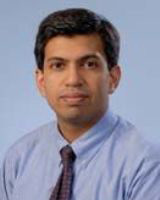 Asif Sharfuddin, MD, is an associate professor of clinical medicine at the Indiana University School of Medicine and a transplant nephrologist at Indiana University Health. He completed his residency, as well as a nephrology fellowship and a transplant nephrology fellowship, at Indiana University School of Medicine. His clinical interests include steroid free immunosuppression, living donor care, and acute kidney injury. He also serves as the Transplant Nephrology Fellowship Program Director, and also works at the RLR VA Medical Center, and is actively involved in research at the transplant center, and has published numerous papers and presented in national meetings.